It's often considered "common sense" that global warming is caused by the Sun. After all, the Sun is the source of almost all of the energy on Earth. The Sun has both direct and indirect influences over the Earth's temperature, and we can evaluate whether these effects could be responsible for a significant amount of the recent global warming. As shown in the Intermediate level rebuttal of this argument, dozens of studies have concluded that the Sun simply cannot account for the recent global warming, but here we'll go through the calculations for ourselves. The Sun's largest influence on the Earth's surface temperature is through incoming solar radiation, also known as total solar irradiance (TSI). Changes in TSI can be converted into a radiative forcing, which tells us the energy imbalance it causes on Earth. This energy imbalance is what causes a global temperature change. The solar radiative forcing is TSI in Watts per square meter (W-m-2) divided by 4 to account for spherical geometry, and multiplied by 0.7 to account for planetary albedo (Meehl 2002). The albedo factor is due to the fact that the planet reflects approximately 30% of the incoming solar radiation. This is a very straightforward and easy to understand formula - the larger the change in solar irradiance, the larger the energy imbalance it causes, and thus the larger the radiative forcing. Studies have reconstructed TSI over the past 300 years. Wang, Lean, and Sheeley (2005) compared a flux transport model with geomagnetic activity and cosmogenic isotope records and to derive a reconstruction of TSI since 1713. Satellites have directly measured TSI since 1978. Where 'dT' is the change in the Earth's average surface temperature, 'λ' is the climate sensitivity, usually with units in Kelvin or degrees Celsius per Watts per square meter (°C/[W-m-2]), and 'dF' is the radiative forcing. So now to calculate the change in temperature, we just need to know the climate sensitivity. Studies have given a possible range of values of 2 to 4.5°C warming for a doubling of CO2 (IPCC 2007), which corresponds to a range of 0.54 to 1.2°C/(W-m-2) for λ. We can then calculate the change in global temperature caused by the increase in TSI since 1900 using the formulas above. Although Wang, Lean, and Sheeley's reconstruction puts the change in TSI since 1900 at about 0.5 W-m-2, previous studies have shown a larger change, so we'll estimate the change in TSI at 0.5 to 2 W-m-2. with a most likely value of 0.22°C. Therefore, the solar forcing combined with the anthropogenic CO2 forcing and other minor forcings (such as decreased volcanic activity) can account for the 0.4°C warming in the early 20th century, with the solar forcing accounting for about 40% of the total warming. Over the past century, this increase in TSI is responsible for about 15-20% of global warming (Meehl 2004). 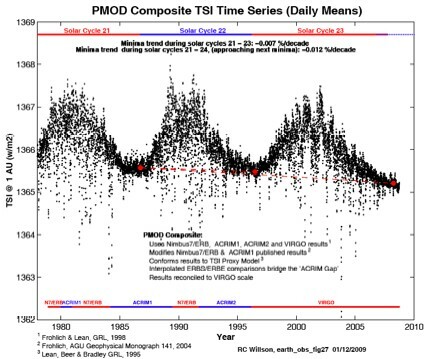 But since TSI hasn't increased in at least the past 32 years (and more like 60 years, based on reconstructions), the Sun is not directly responsible for the warming over that period. Foster and Rahmstorf (2011) used multiple linear regression to quantify and remove the effects of the El Niño Southern Oscillation (ENSO) and solar and volcanic activity from the surface and lower troposphere temperature data. They found that since 1979, solar activity has had a very slight cooling effect of between -0.014 and -0.023°C per decade, depending on the data set (Table 1, Figure 3). Figure 3: Influence of exogenous factors on global temperature for GISS (blue) and RSS data (red). (a) MEI; (b) AOD; (c) TSI. 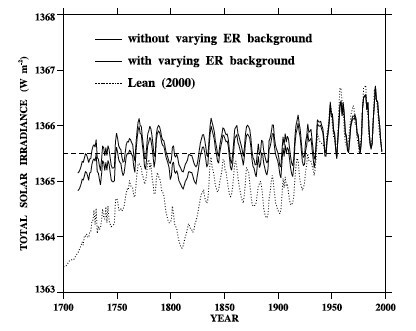 Like Foster and Rahmstorf, Lean and Rind (2008)performed a multiple linear regression on the temperature data, and found that while solar activity can account for about 11% of the global warming from 1889 to 2006, it can only account for 1.6% of the warming from 1955 to 2005, and had a slight cooling effect (-0.004°C per decade) from 1979 to 2005. Similarly, Schurer et al. (2013) uses multiple linear regression and finds that the sun is unlikely to have caused more than 0.15°C of the observed approximately 1°C warming over the past 300 years. Note that this multiple linear regression technique it makes no assumptions about various solar effects. Any solar effect (either direct or indirect) which is correlated to solar activity (i.e. solar irradiance, solar magnetic field [and thus galactic cosmic rays], ultraviolet [UV] radiation, etc.) is accounted for in the linear regression. Both Lean and Rind and Foster and Rahmstorf found that solar activity has played a very small role in the recent observed global warming. It has also been proposed that ultraviolet (UV) radiation, which varies more than other solar irradiance wavelengths, could amplify the solar influence on the global climate through interactions with the stratosphere and atmospheric ozone. Shindell et al. (1999) examined this possibility, but found that while this UV variability has a significant influence over regional temperatures, it has little effect on global surface temperatures. "Solar cycle variability may therefore play a significant role in regional surface temperatures, even though its influence on the global mean surface temperature is small (0.07 K for December–February)." Moreover, Shindell et al. 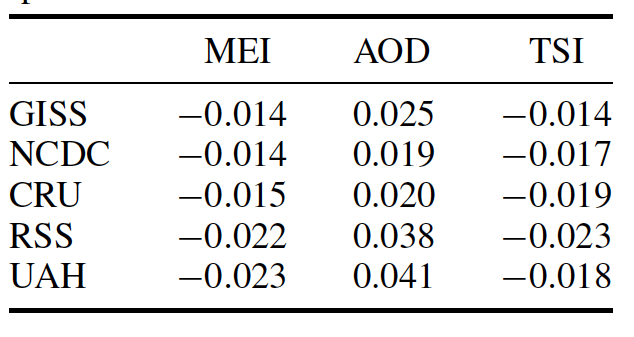 found that anthropogenic ozone depletion (via chlorofluorocarbon emissions) may have reduced the impact of UV variability on the climate, and may have even offset it entirely. "Another consideration is that upper stratospheric ozone has decreased significantly since the 1970s as a result of destruction by halogens released from chlorofluorocarbons. This ozone decrease, which has been much larger than the modeled solar-induced ozone increases, may have limited the ability of solar irradiance changes to affect climate over recent decades, or may have even offset those effects." Solar magnetic field must have a long-term positive trend. Galactic cosmic ray flux on Earth must have a long-term negative trend. Cosmic rays must successfully seed low-level clouds. Low-level cloud cover must have a long-term negative trend. Fortunately we have empirical observations with which to test these requirements. Solar magnetic field strength correlates strongly with other solar activity, such as TSI and sunspot number. As is the case with these other solar attributes, solar magnetic field has not changed appreciably over the past three decades (Lockwood 2001). Cosmic ray flux on Earth has been monitored since the mid-20th century, and has shown no significant trend over that period. "the variation of ionization by galactic cosmic rays over the decadal solar cycle does not entail a response...that would explain observed variations in global cloud cover"
"we estimate that less than 23%, at the 95% confidence level, of the 11-year cycle changes in the globally averaged cloud cover observed in solar cycle 22 is due to the change in the rate of ionization from the solar modulation of cosmic rays." "no statistically significant correlations were found between any of the four cloud parameters and GCR"
"no response of global cloud cover to Forbush decreases at any altitude and latitude." "galactic cosmic rays appear to play a minor role for atmospheric aerosol formation events, and so for the connected aerosol-climate effects as well." "Global mean time series of surface- and satellite-observed low-level and total cloud cover exhibit very large discrepancies, however, implying that artifacts exist in one or both data sets....The surface-observed low-level cloud cover time series averaged over the global ocean appears suspicious because it reports a very large 5%-sky-cover increase between 1952 and 1997. Unless low-level cloud albedo substantially decreased during this time period, the reduced solar absorption caused by the reported enhancement of cloud cover would have resulted in cooling of the climate system that is inconsistent with the observed temperature record." So the jury is still out regarding whether or not there's a long-term trend in low-level cloud cover. In addition to these multiple lines of empirical evidence which contradict the GCR warming theory, the galactic cosmic ray theory cannot easily explain the cooling of the upper atmosphere, greater warming at night, or greater warming at higher latitudes. These are fingerprints of the increased greenhouse effect, the major mechanism of anthropogenic global warming. Some individuals, most notably Fred Singer, have argued that Dansgaard-Oeschger (D-O, a.k.a. Bond) events could be causing the current global warming. D-O events are rapid climate fluctuations that occur quasi-periodically with a 1,470-year recurrance time and which, according to Singer, are "likely caused by the sun." However, there is significant debate as to the cause of these D-O events, with changes in solar output being just one possibility (NOAA Paleoclimatology). Regardless, the most obvious flaw in this argument is that the planet wasn't warming 1,470 years ago. The previous warm event was the Medieval Warm Period approximately 1,000 years ago. "evidence from cores near Newfoundland confirms previous suggestions that the Little lce Age was the most recent cold phase of the 1-2kyr cycle"
And a study by Rahmstorf (2003) also concludes that the LIA may be the most recent cold phase of the D-O cycle, and his research suggests that the 1,470-year periodicity is so regular that it's more likely due to an orbital cycle than a solar cycle. "While the earlier estimate of ±20% [Schulz, 2002] is consistent with a solar cycle (the 11-year sunspot cycle varies in period by ±14%), a much higher precision would point more to an orbital cycle. The closest cycle known so far is a lunar cycle of 1,800 years [De Rop, 1971], which cannot be reconciled with the 1,470-year pacing found in the Greenland data. The origin of this regular pacing thus remains a mystery." However, according to Braun et al. (2005), D-O events could be caused by a combination of solar cycles and freshwater input into the North Atlantic Ocean. But their study also concludes that D-O events are not expected to occur during the Holocene (the current geologic epoch). "the 1,470-year climate response in the simulation is restricted to glacial climate and cannot be excited for substantially different (such as Holocene) boundary conditions...Thus, our mechanism for the glacial ,1,470-year climate cycle is also consistent with the lack of a clear and pronounced 1,470-year cycle in Holocene climate archives." The bottom line is that regardless of whether or not the D-O cycles are triggered by the Sun, the timing is clearly not right for this cycle to be responsible for the current warming. Particularly since solar output has not increased in approximately 60 years, and has only increased a fraction of a percent in the past 300 years, as discussed above. Ironically, prior to publishing a book in 2007 which blamed the current warming on D-O cycles, Singer argued that the planet wasn't warming as recently as 2003. So the planet isn't warming, but it's warming due to the D-O cycles? It's quite clear that in reality, neither of these contradictory arguments is even remotely correct. Aside from the fact that solar effects cannot physically explain the recent global warming, as with GCRs, there are several empirical observations which solar warming could not account for. For example, if global warming were due to increased solar output, we would expect to see all layers of the atmosphere warm, and more warming during the day when the surface is bombarded with solar radiation than at night. Instead we observe a cooling of the upper atmosphere and greater warming at night, which are fingerprints of the increased greenhouse effect. Figure 6 is a similar graphic to that presented in Meehl et al. (2004), comparing the average global surface warming simulated by the model using natural forcings only (blue), anthropogenic forcings only (red), and the combination of the two (gray). 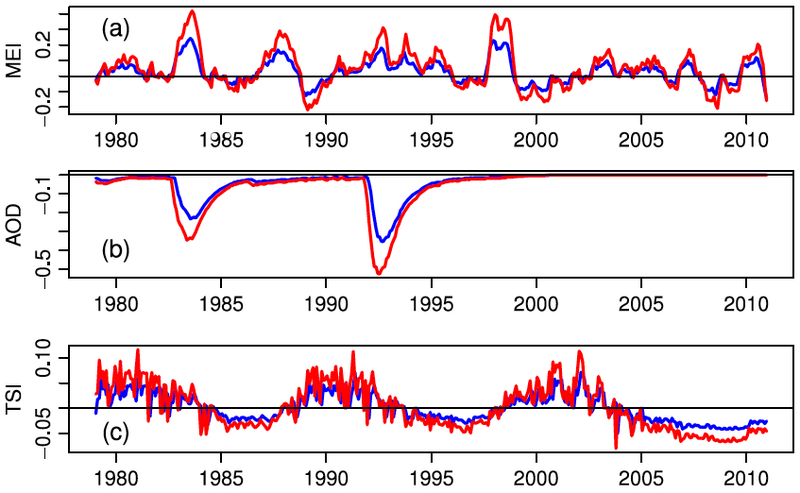 Figure 6: Time series of anthropogenic and natural forcings contributions to total simulated and observed global temperature change. The coloured shadings denote the 5-95% uncertainty range. In Figure 7, Huber and Knutti break down the anthropogenic and natural forcings into their individual components to quantify the amount of warming caused by each since the 1850s (Figure 7b), 1950s (7c), and projected from 2000 to 2050 using the IPCC SRES A2 emissions scenario as business-as-usual (7d). Figure 7: Contributions of individual forcing agents to the total decadal temperature change for three time periods. Error bars denote the 5–95% uncertainty range. The grey shading shows the estimated 5–95% range for internal variability based on the CMIP3 climate models. Observations are shown as dashed lines. A number of studies have used a variety of statistical and physical approaches to determine the contribution of greenhouse gases and other effects to the observed global warming. 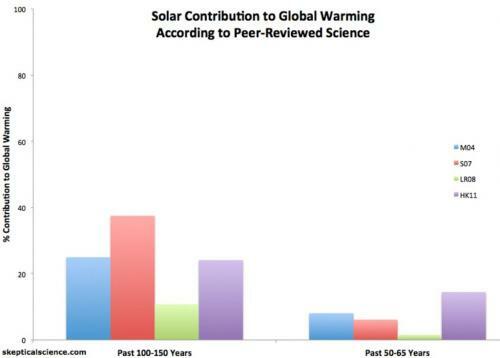 Those studies find a relatively small solar contribution to global warming, particularly in recent decades (Figure 8). Figure 8: Solar contribution to global warming according to Meehl et al. 2004 (M04, blue), Stone et al. 2007 (S07, red), Lean and Rind 2008 (LR08, green), and Huber and Knutti 2011 (HK11, purple).